The premise of Flying Witch is simple enough. Makoto Kowata is a fledgling witch who, per the instruction of her parents, goes to the countryside in order to continue her studies. Here she meets Chinatsu Kuramoto, the youngest daughter of the Kuramoto household where Makoto ends up staying, who upon discovering Makoto’s magical powers wishes to become a witch, herself. Thus begins their adventures of discovering all sorts of magic and witchcraft. On the surface, the show presents itself as would any slice-of-life with a set protocol. There’s the premise that sets up the worldview and what to expect from it. As far as Flying Witch is concerned, this world accepts the concept of witches as a matter of fact (though witches, themselves, choose to keep their existence and practices discreet). But even with this fictional set-up, it’s easy to dismiss the show as mundane, presenting similarly mundane familial scenarios with the occasional “educational” segments that talk about local Japanese customs, pastoral life, and even cooking lessons. But on closer inspection, Flying Witch is far more purposive in being as mundane as it is. To understand what I mean by this, it is probably informative to discuss first what generates interest in slice-of-life shows in the first place. 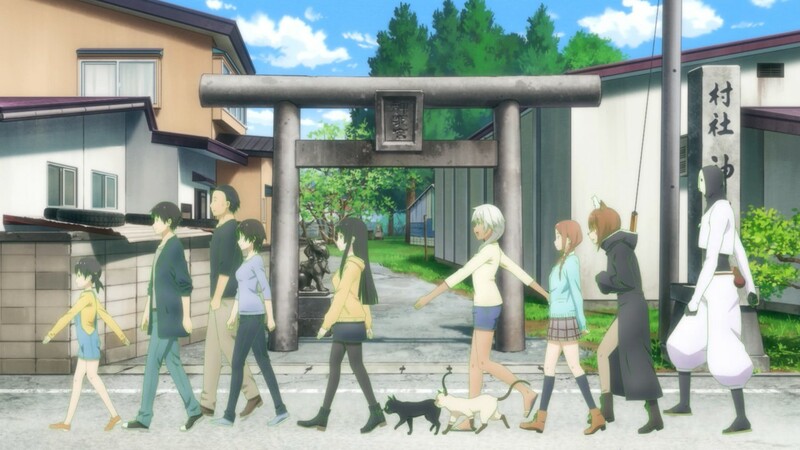 The slice-of-life genre is often a collection of seemingly generic characters that gain relevance to the viewer due to familiarity and resonance. The former is similar to the topic of interest — we’re interested in what these characters do and what they talk about because we are interested in the same things. The latter is their response to these topics of interest — we’re invested in their reactions to these situations because we resonate with their experience, be it positive or negative. A good slice-of-life show, therefore, embraces each character’s unique response beyond the generic, granting them relevance to the viewer. 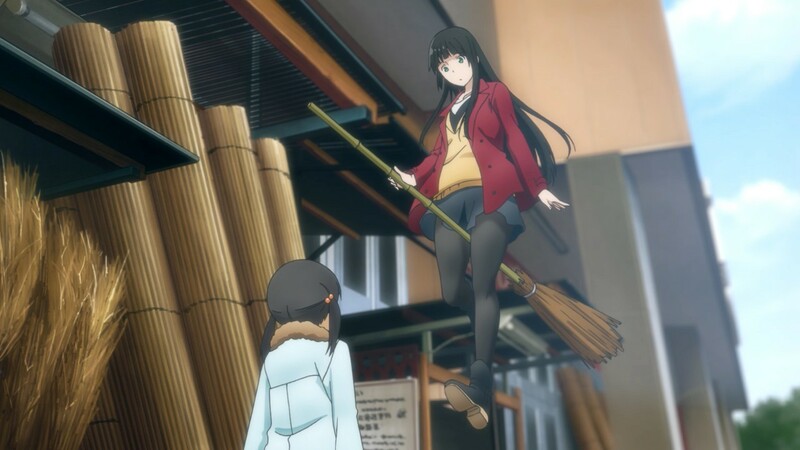 Flying Witch presents us with the idea of Magic and Witches, so by virtue of familiarity, you’d expect glyphs and magic wands and quidditch and floating objects, right? Well, not really. But as early as the first episode, it’s clear that the concept of Magic is heavily downplayed in this show. In the first episode when when Makoto first rides a broomstick, for example, the moment does indeed feel magical. But her comment on it feeling awkward due to the broom being made of bamboo was such an anti-climactic statement after the fact, it practically dismissed the whole act as insignificant altogether. And the show doesn’t fail to downplay magic even further throughout its run to the point that it doesn’t even bother to depict it in the frame at all. Because the point of the show isn’t the magic; rather, it’s in how its characters perceive magic in a mundane world. When we aren’t distracted by the flashing lights and the lengthy incantations, we’re allowed more time to realize what it means to be confronted by something magical. 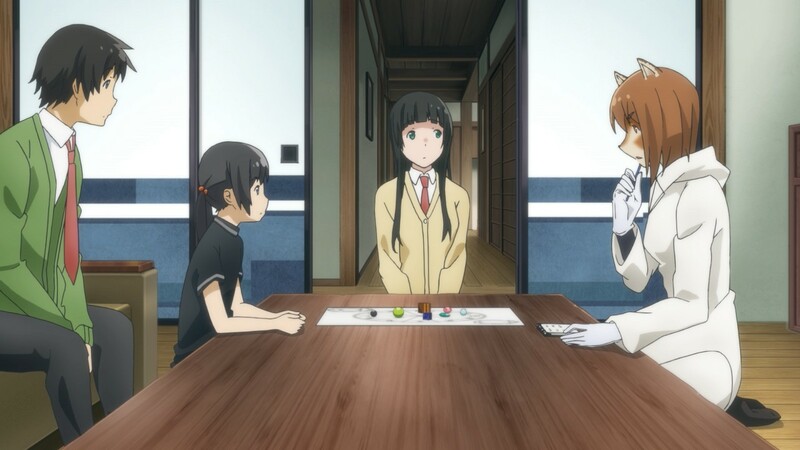 And this is where Flying Witch excels by utilizing characters like Chinatsu as a focal point in our interactions with Makoto’s antics as a witch. Indeed, much of the resonance in the show is generated from how its characters band together to embrace the ideas of magic that are steadily presented to them through characters like Akane, Inukai, and the Harbringer of Spring. Even Makoto is drawn by a constant wonder that is similar to Chinatsu’s own child-like appreciation of the mundane. And this is where the message of this show becomes clear: magic is in the mundane. That there is something special in discovering magic in everyday life. Be it in the form of nostalgia by reminiscing past experiences whilst rummaging through old trinkets, or simply enjoying the company of friends and family — there is a kind of magic in the world of Flying Witch that isn’t the direct product of witches. In fact the show purposely downplays the role of witches in order for us to embrace what the knowledge of that fact does for people like Chinatsu and Makoto. For Chinatsu, at least, knowledge of the existence of magic and witches has given her a sort of unrestrained optimism. Her perspective as a child helps in drawing parallels between her experiences of the magical and the mundane, viewing each of them equally with an infectious child-like wonder. In episode 5, for example, Chinatsu follows Makoto’s cat when it goes out for a walk, hoping to discover what a Witch’s familiar does on its free time. Throughout the sequence, however, she dismisses obviously dubious things like a ghostly face on a wooden plank as mundane; instead finding more delight in cherry blossom petals and idle talk with a stranger. On the other hand, Makoto‘s background as a witch–in-training serves as a means for the viewers to discover more about the world alongside her, viewing each new experience as intrinsically related to the world of magic in ways that are more mundane than we’d expect. Going back to the previous example, Makoto ends up going though the same route as Chinatsu did later in the episode, where it is revealed that the things Chinatsu saw were actually even more mundane than she made them out to be. In fact what was truly magical in that episode was something totally unassuming — the aforementioned stranger they both met, who apparently had a previous encounter with a witch in the past that changed her life. And this brings us back to what makes a good slice-of-life show. 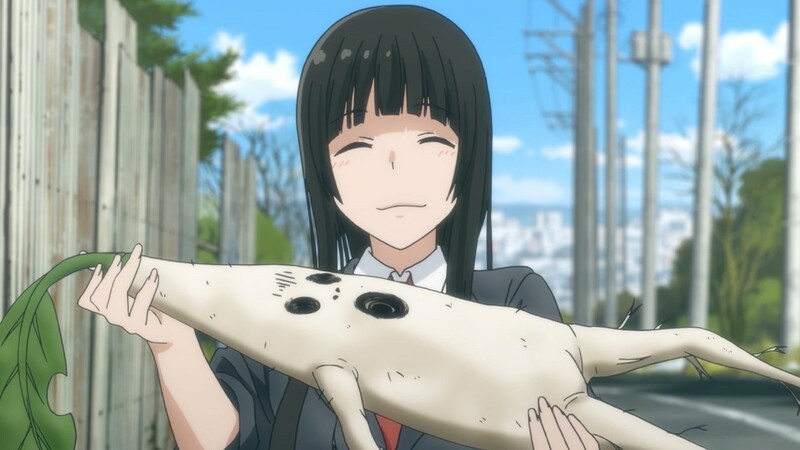 In disregarding our views and expectations of magic and witches, Flying Witch succeeds in allowing us to share in the wonder of its characters, resonating with their experiences and discovering a different kind of magic in the world they inhabit. By doing this, the experience of learning more about Japanese culture, pastoral life, or even cooking becomes less an overt argument against urbanization than it is an invitation to escape our own closed-mindedness. In embracing the child-like wonder of both Chinatsu and Makoto, we are invited to discover magic beyond the world of Flying Witch — to realize magic in every encounter, no mater how mundane or insignificant it may appear to be. And this is what makes the show infinitely fascinating for me. You don’t need bang or fluff to make a great show — all you need is a clear purpose and a thoughtful message. Flying Witch had both of these: a purposefully downplayed depiction of magic as a statement to discover magic in the mundane. True, this show was graced with a wonderful soundtrack and warm visuals, but that only served as the icing on top of an already deliciously sweet cake. Flying Witch succeeds in understanding the value of magic in a world consumed by modernity. But instead of challenging modernity directly, it focuses its energy in reminding us that the oft overlooked joys of life — family, friends, nature — are all around us. All we need to do is recognize the magic that lies hidden within each of these, and in doing so, never take any such encounter for granted. Extending this to our own lived experience, there is magic all around us — in particular, in acts of love. I can’t help but feel motivated after watching this show in light of the events that have transpired in 2016. In a world so burdened by pessimism and self-defeating statements, Flying Witch is a breath of fresh air for the disheartened; a soothing hand to the jaded who feel like the world has gone to heck. If you need a show to heal the soul and remind you that there is, indeed, magic in this world, then look no further. I’ve said it once, and I’ll say it again: this is the best feel-good show I’ve seen in a long time. Hands down. 2016 was a rough year. I might need some feel-good vibes once 2017 starts. Thanks for sharing your thoughts. Did you watch Amanchu? It was written by the gal behind Aria and I think it was an uplifting SoL. Flying Witch is also one of my favorite series from 2016 (Amanchu, also). Of course, slice-of-life is my favorite genre. . .it might also help that I’m a practicing Wiccan. But you’ve certainly hit the nail on the head–the mundane is magic; all things are. But this series is done in a particularly soft and warm style that makes the viewer feel instantly at home–and the Kuramoto home is a great place to be!